On its own, there was nothing special about the room. In fact, it was the antithesis of special: Generic and drab, it looked like hundreds of other tired, 1960s-era college dorm lobbies, furnished to withstand the antics of students whose parents weren’t on hand to tell them to keep their sneakers and snacks off the furniture. But in that room, tucked around the corner, was a piano. And when China played that piano, everything about the room changed. It was June 2012, and I was on the campus of Mount Holyoke College in Massachusetts for a weeklong of Glen writing workshop with Lauren Winner. Staying in a dorm for the first time in 20 years made me feel a bit like a teen again, brimming with that same sense of nervous excitement. Who were all of the people I caught glimpses of as they came and went from their rooms down the hall? Which ones would I be hugging fiercely by the end of the week, as we said goodbye? That first evening—after dinner, the opening talk, and a welcome reception—many retreated to their rooms to recover from a long day of travel. But the extrovert in me knew that going to my room would lead to nothing more than a predictable evening: checking email, doing some reading, then falling asleep. If I wanted to open up my evening to surprise and possibility, I needed to venture into a public space: the dorm lobby. Those who had been to the Glen before and understood how things “worked” had already started to gather. Plastic cups and bottles of wine were set out on the marred coffee table, and several institutional couches had been pulled up close. Bags of pretzels and popcorn were opened, and much talking and introducing ensued. I introduced myself to people, but mostly observed, holding back—waiting to feel myself soften into this new space. The piano had belonged to my grandmother. 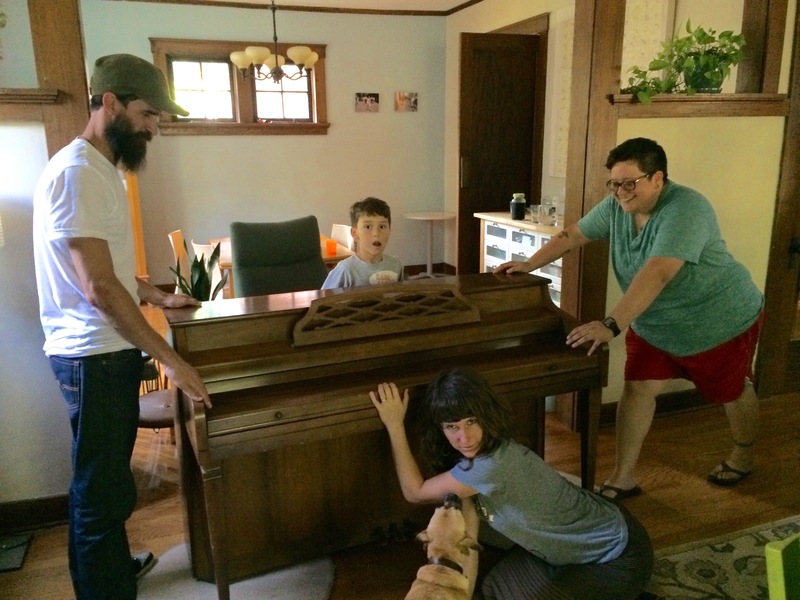 During my childhood, the piano’s home was a cabin in the woods of Northern Michigan, where my grandma’s expert playing inspired many sing-alongs. 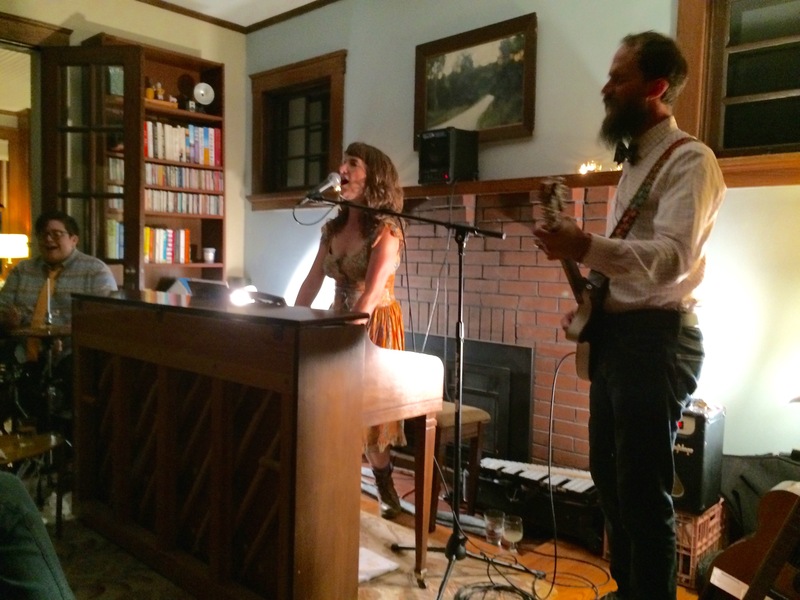 Tonight, China will play that piano, at a house concert we’re hosting for her band Alright Alright. Life has been scooting along so frantically as of late that it takes my mind a moment to accept the wonderful reality: China and I are together again, this time in my home, with our husbands and children. Now we know one another as mothers and wives, and also as creative women who labor with the words and stories we must tell. As we hug and laugh and both talk at once, rushing around to prepare the space for this new joint venture, I sense our understandings of one another rounding out. But our friendship also feels the same—full of goofiness and grace, with flashes of depth that root us over breadths of geography and time. We move the piano from its place by the front stairwell across the living room to the fireplace. The Danish modern armchair my husband likes to sit in after work is moved to the living room’s opposite corner, making room for a variety of guitars and China’s husband Seth, who will play them. Katelin, the band’s third member, sets up a small drum set and a ukelele and guitar to the left of the piano, near our tall bookshelf. I arrange dining room chairs on the rug and on the stage’s “wings”—the sunroom that opens to the east of the piano and the dining room to the west. Extension cords are run from outlets, power strips and amps are plugged in, spot lights are directed. The room has been transformed. Soon, friends begin to arrive. Wine is poured. Introductions are made. Then China begins playing the piano. The space is complete. This entry was posted in Creating Place and tagged across miles, Alright Alright, band, community, connection, creative, dorm life, friendship, gathering, Glen Workshop, house show, Illinois, living room, long distance, Massachusetts, music, New Mexico, piano. Bookmark the permalink. What a great piece, Kristin! It’s so neat to read about connections made at the Glen Workshop. China is such a cool cat. And what a neat memory of that summer in 2012 when we were in Lauren’s class. Great piece – but I love it even more because I also know China. How wonderful that you got to be together again. Not only do you know China, but you were there in that dorm lobby, eating all the Trader Joe’s snacks with me. 🙂 I’m so glad we shared that time together. Kristin, this piece is you! So much here: creativity, family, friendship, and hospitality. You are called to be an artist, transformer, and a generous servant. Thank you for sharing multiple scenes of your life with your words. Thank you, Lisa. At my church we’ve been going through a process based on Parker Palmer’s concept about “living the life that wants to live you.” You’ve hit my nail on the head, in terms of my need to bring people together in meaningful, soul-filling ways. I’ve realized I need to keep making space for these opportunities in my life.